Gulf Coast Filters, manufacturer of Americaâ€™s Premier Bypass Oil Filters, will be attending the 2015 Mid-America Truck Show in Louisville, KY. Please come visit us at booth number 10045 to check out the highest quality Bypass Oil Filtration Systems and Oil Analysis Program on the market. Our Booth is located in the North Wing. Gulf Coast Filters 1-Micron Replacement Filters and Exclusive Oil Samples are now available at TravelCenters of America and Petro Stopping Centers Stops Nationwide. The Gulf Coast Filter systems were recently tested in accordance with worldwide recognized ISO standards and proven to remove particles below one micron in size. Also in this unprecedented testing the Model O-2 Oil Filter was proven to remove over two pounds of ISO Fine Test Dust, compared to only 2.5 ounces on a 1 quart competitive filter. Gulf Coast Filters has been a leader in Bypass Oil Filtration and Oil Analysis for well over 25 Years and has been tested by The US Air Force, NASA, Shell Offshore, North Carolina Department of Transportation and many other companies seeking the finest filtration systems in the industry. To find out more about the Gulf Coast Bypass Oil Filter go to: View Our Testimonials Or call us at 800-398-8114. Or call us at 800-398-8114. 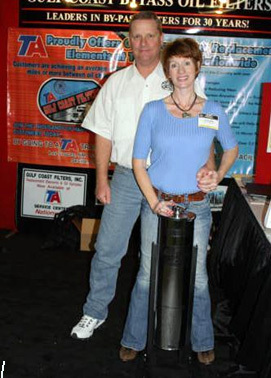 Gulf Coast Filters, manufacturer of America’s Premier Bypass Oil Filters, will be attending the 2013 Mid-West Truck Show in Peoria, IL. Please come visit us at Space R to check out the highest quality Bypass Oil Filtration Systems on the market and see the Gulf Coast Filter System installed on a truck. Gulf Coast Bypass Oil Filters are proud to announce that there are now 20 Select Installation Locations at TravelCenters of America and Petro Stopping Centers. Go to the locations below and purchase your Gulf Coast Bypass Oil Filter Today. Financing is also available for a limited time. For existing Customers, Gulf Coast Replacement Filters and Oil Samples are now in stock at TravelCenters of America and Petro Stopping Centers Nationwide. Don’t put off Saving your Engine any longer, get the Gulf Coast Bypass Oil Filter Today!! Gulf Coast Filters, manufacturer of America’s Premier Bypass Oil Filters, will be attending the Joplin 44 Truckers Jamboree at the Joplin 44 Petro in Joplin, MO. Please come by and meet us and check out the highest quality Bypass Oil Filtration Systems on the market. There will also be a Leland Martin Concert on Friday night so be sure and attend to listen to some really good trucking and traditional Country Music. DEMO OF OUR STATE OF THE ART CONTROL SYSTEM… Whether you are maintaining fuel on one boat or involved in Facility Management for a thousand buildings, Gulf Coast Filters can provide the information you need right to your computer. STEVE BARRAS, National Marketing Director of Gulf Coast Filters Inc. (GCF), has announced that GCF will be exhibiting at the annual Miami International Boat Show. The event is one of the premiere boat shows. Barras stated that “the name Gulf Coast Filters has become synonymous with the “BEST FUEL POLISHING SYSTEMS” “Once people were asking “what is fuel polishing” today they are saying “I’ve done my research and now I want to order THE Gulf Coast Fuel Polishing System.” The reason is simple; Gulf Coast Filters continues to be the Standout Leader in Marine Filtration. Barras continues, “With unprecedented testing in accordance with world renowned standards, Gulf Coast Filters continues to demonstrate why they are the BEST.” “Gulf Coast Filters controls the environment inside your fuel tanks” “I always ask potential customers “what would you prefer dead algae or no algae.” Using chemicals and other gadgets and gimmicks to kill microbes is a Reactive effort,” Barras says, “With Gulf Coast Filters our customers are Proactive, PREVENTING MICROBIAL growth in the first place.” “With the yachting community starting to get back on its feet, contaminated fuel is the common denominator.” People are saying “ I don’t want to keep calling in the polishing truck, they are expensive and for a one time investment I can have a lifetime Gulf Coast Fuel Polishing System, I know the GCF system works. And, it keeps on working.” Gulf Coast Filters: Simple, Effective and built to last a lifetime. PUT THE PLEASURE BACK INTO YOUR PLEASURE BOATING. Gulf Coast Filters, manufacturer of America’s Premier Bypass Oil Filters, will be attending the 2012 Mid-West Truck Show in Peoria, IL. Please come visit us at booth number 741 to check out the highest quality Bypass Oil Filtration Systems on the market. Jerry Sims, President of Gulf Coast Filters will be giving seminars on bypass oil filters and oil analysis both days of the show. "Current Gulf Coast Users, boy do we have a special for you! In September and October when you get your filter replacement service completed at TA or Petro and swipe your Ultra One card you will receive 5 Times the total regular points on the entire work order. Just so you know, TA and Petro NOW have the Gulf Coast Oil Samples, Part Number- 503-135. Go to TA or Petro, Replace your filters, and get 5 Times the total work order points!" "Current Gulf Coast Users boy do we have a special for you! In September and October when you get your filter replacement service completed at TA or Petro and swipe your Ultra One card you will receive 5 Times the total regular points on the entire work order. Just so you know TA and Petro NOW have the Gulf Coast Oil Samples, Part Number- 503-135. Go to TA or Petro, Replace your filters, and get 5 Times the total work order points!" Gulf Coast Filters, manufacturer of America’s Premier Bypass Oil Filters, will be attending the Grand Opening Celebration at the Joplin 44 Petro in Joplin, MO. Please come by and meet us and check out the highest quality Bypass Oil Filtration Systems on the market. There will also be a Leland Martin Concert on Friday night so be sure and attend to listen to some really good trucking and traditional Country Music. Gulfport, Mississippi, January 22, 2011 – Gulf Coast Filters, Inc. manufacturer of America’s Premier Bypass Oil Filters will be exhibiting at the 2011 Mid-America Truck Show in Louisville, KY. Please visit us at booth number 68068. Check out the highest quality Bypass Oil Filtration Systems on the market. Gulf Coast Filters is pleased to announce that their replacement filters are now available at TA Travel Centers of America Truck Stops Nationwide. Gulf Coast Filter systems were recently tested in accordance with worldwide recognized ISO standards and proven to remove particles below one micron in size. Also in this unprecedented testing the Model O-2 Oil Filter was proven to remove over two pounds of ISO Fine Test Dust, compared to only 2.5 ounces on a 1 quart competitive filter. Or call us at 800.398.8114. Attention Truckers, Leland Martin is now selling a benefit CD with 100% of the profits going to singer Jack Kapanka, who was involved in a major traffic accident. Jack is recovering fine but with multiple surgeries his medical bills are mounting making it extremely difficult for his family. 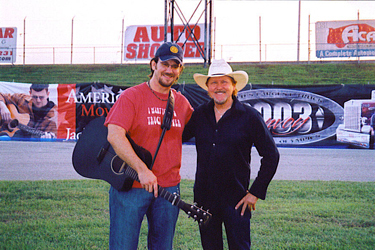 Jack, known for his trucking song “America Moves by Truck” has always been there for truckers, being involved in many of the Trucking Convoys’ for Special Olympics. See the message below from Leland with a link to take you to his store to purchase the tribute song he wrote about Jack. Whether you are a trucker or not, please consider helping Jack, he is a true Patriot!! Or call us at 337.319.8240. Gulf Coast Bypass Oil Filters have been in the filtration business for over 25 Years and has the Best Oil Analysis Program in the Country. Tested and used by Shell Offshore, NASA, North Carolina DOT and branches of the US Military, Gulf Coast Filters continues to provide the finest filtration systems in the world. The Gulf Coast Filters systems were recently tested in accordance with worldwide recognized ISO standards and proven to remove particles below one micron in size. Also in this unprecedented testing the Model O-2 Oil Filter was proven to remove over two pounds of ISO Fine Test Dust. Or call Gulf Coast Filters, Inc. at 800-398-8114. 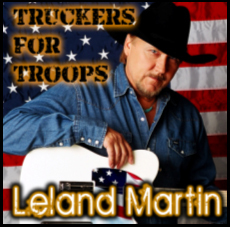 Join Leland Martin and OOIDA in Supporting our Troops!! 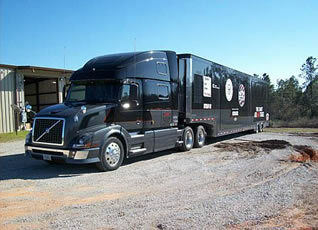 TRUCKERS FOR TROOPS C.D. IS HERE!! BRAND NEW FROM LELAND! 12 trucking and patriotic songs!! Leland is donating a portion of all sales, to OOIDA's Truckers For Troops Fund! Help send care packages to our soldiers, overseas. Go to this Link to order your copy today!! http://www.lelandmartin.com/store.html Thanks for your support and God Bless our Troops!!!!!! Leland Martin will be at our booth all 3 days of the show to sign autographs and meet fans. We will also have a free drawing each day for an autographed Die cast replica of the truck in Leland’s Stone Cold Fingers Video. Leland Martin will be doing a FREE PERFORMANCE at Papa Johns Cardinals Stadium Parking Lot; 2800 South Floyd Street, Louisville, KY 40208; on Thursday, March 19th, at 8:00 PM. 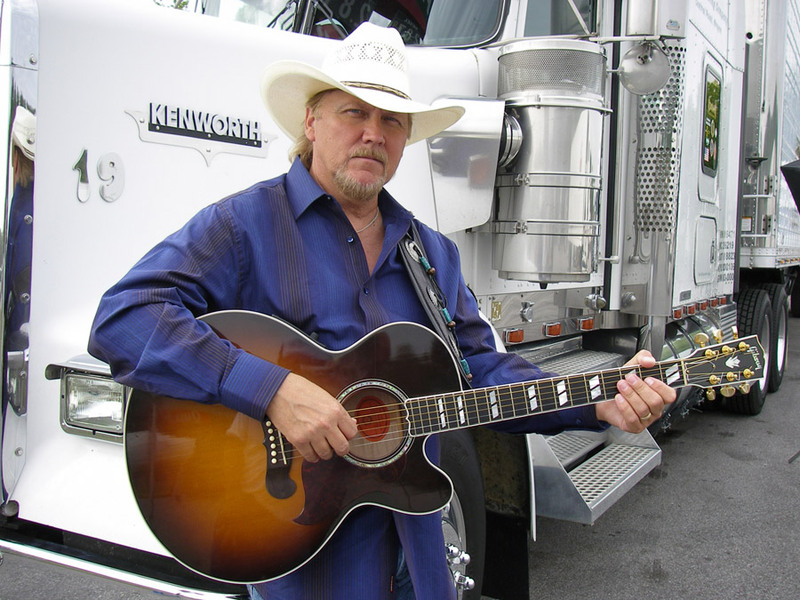 Leland will be performing some of his latest songs from his BRAND NEW CD (I"LL PICK THE GUITAR, YOU DRIVE THE TRUCK featuring the fan favorite Royal Purple Peterbilt and many more), which he will have available for purchase at the Mid America Truck Show. Also, Gulf Coast Filters will be raffling off a Peavey Guitar, $2.00 per chance, all proceeds go to the ST. Christopher Fund. http://www.truckersfund.com/ This is a custom lettered Gulf Coast Filter Guitar with Mr. Hartley Peavey’s personal autograph. 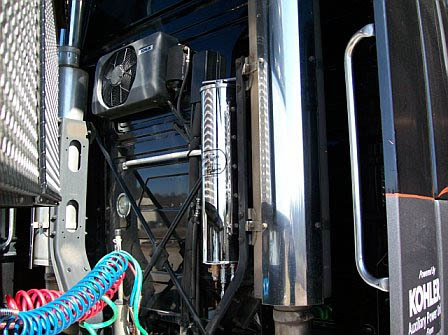 See the Gulf Coast Model O-2 Filter installed on The Dart Volvo Simulator. 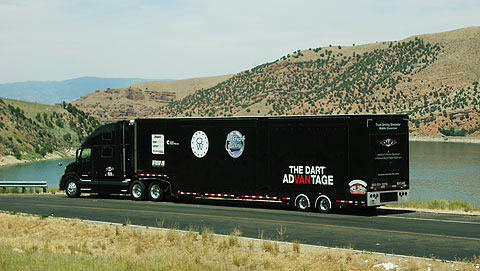 The Dart Transit "Safety Advantage" simulator is a unique mobile training tool that was created for the trucking industry. 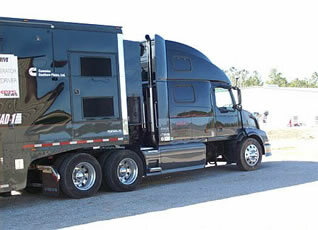 The full-motion truck driving simulator is designed for two specific and very different audiences. In a classroom configuration the system will be used for driver training. In the exhibit set up it will be a walk-through, highly interactive exhibit that will allow the public to climb into the simulator and see what it's like to share the road from a truck driver's perspective. 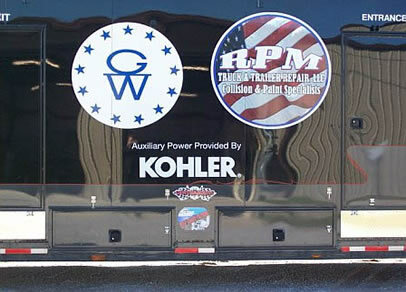 Gulfport, Mississippi., May 3, 2004 â€“ Gulf Coast Filters, manufacturer of Fuel Filters and Bypass Oil Filters has announced that their custom Fuel Polishing Systems will be installed on new luxury yachts manufactured by Ocean Alexander. Alexander Marine has developed a full range of motoryachts that are the result of a unique blend of old-world craftsmanship, modern high-technology materials, and design and construction techniques. With over 25 years of experience and over 1,500 vessels delivered, Ocean Alexander is one the finest luxury motoryachts available today. With the demand for fuel polishing growing, Ocean Alexander chose Gulf Coast Fuel Polishers over all other brands mainly because of their reputation for quality, simplicity, and customer praise. 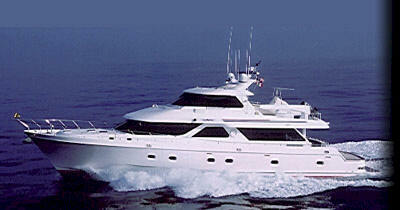 Gulf Coast Filters has already shipped units to be installed on 7 new yachts currently under construction. GCF Fuel Polishing Systems use state of the art water sensing technology and high quality Oberdorfer Bronze Gear Pumps. These systems are designed to automatically circulate and clean the fuel tanks while the boat is sitting idle to assure the vessel owner of clean fuel at all times. The GCF System uses the largest water separator on the market along with a massive 16 Oz. replacement filter that can remove particles below 1-micron and also remove moisture down to 40 PPM. Jerry Sims, President of GCF Filters in Gulfport, Mississippi says, "We are very excited about the pleasure boat market. We mainly market to the 30 feet and up diesel powered boats that sit for long periods of time." Gulf Coast Fuel Polishing Systems are currently sold worldwide and have received national recognition for saving the Texas Army National Guard over $1,000,000 polishing fuel in their M-1 Abrams Tanks and many other pieces of equipment. Other users include Seahorse Marine, Kristen Yachts, Breaux Brothers Enterprises, North Carolina Department of Transportation, Shell Offshore and NASA. Altus strives to make each boat better than the previous one. With over 25 years of experience and more than 1,000 vessels to the name, Altus crafts nothing but the finest motor yachts in the business. With every Altus design, naval architect Ed Monk Jr. and the engineering team take pride in creating the most structurally proficient and safest vessel possible, while enhancing performance and overall appearance. Altus vessels are engineered and constructed under constant supervision; they must pass a rigorous battery of tests before reaching the customer. For example, no other yacht company spends more time and effort assessing and improving hull designs. Copyright © 2002-2005 Gulf Coast Filters, Inc. All Rights Reserved.